The Arena GPS is a compilation of basic exercises with graphics and brief explanations that you can take with you into the arena in order to obtain ideas for training exercises. The old masters discovered early on that riding accurate arena patterns is the prerequisite for balance and straightness, which in turn are the prerequisites for accessing the haunches. Therefore, it has to form the beginning of any gymnastically useful work. In combination with transitions and lateral movements the arena patterns are one of the most important tools the rider possesses in training the horse. We use round patterns such as circles, voltes, serpentines, and ovals, as well as angular patterns such as rectangles, squares, and triangles. There are some exercises that you can ride at the walk with a training or 1st level horse, but if you ride them at the canter, you may need an FEI horse. You can also disassemble the exercises and make new ones out of the component pieces. This 3-month course begins March 4, 2019. Reserve your spot now. Straightness… Crookedness… Hollow side… Stiff side… Weak side… Strong side... Are you confused yet??? This is SUCH a big topic for riders and dressage training but also it is such a confusing topic for soooo many. 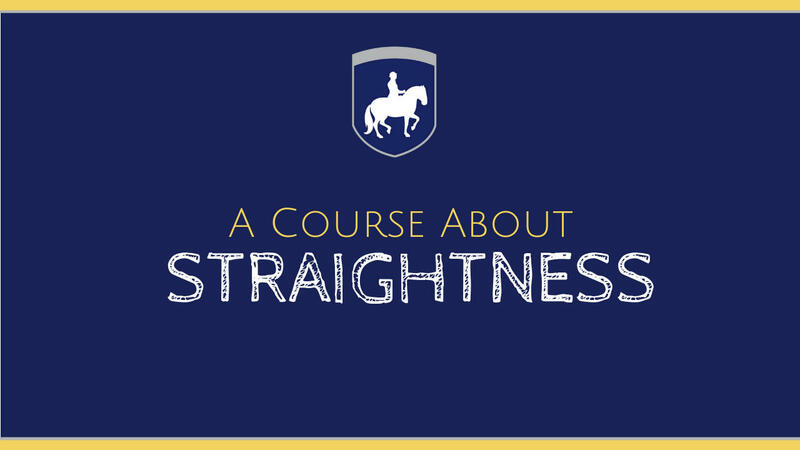 In this online course, we are going to break down what straightness and crookedness means. We are to going to explain in great detail how to understand this topic, and what YOU can about it. Questions? Email us at [email protected] .